We are committed to providing you with the best dental service. Our objective is to not only provide you with a brilliant smile that you can be proud of, but we want to make sure you have a healthy smile as well. Our exams are thorough and always pain free. We understand how uneasy some patients may feel about their dental visits, we make sure that you are comfortable and relaxed and that all of your questions and concerns are addressed. Dr. May uses an intraoral camera that allows you to see exactly what he sees during your examination. Together, you'll go over step-by-step the care you need to maintain your healthy smile. You'll find that Dr. May, his hygienists, and chairside staff are friendly and easy to talk to - always ready with answers to your dental questions. And that's important in making sure you get the care you need. You wont be able to hide your smile! Ultrasonic cleaning, polishing, and sealants on a regular basis to give you healthy teeth and a beautiful smile and to prevent expensive problems in the future. State-of-the-art soft-tissue management helps to ensure the health of your gums and the life of your teeth. 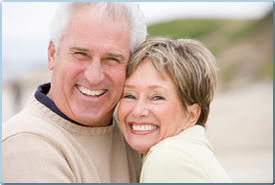 Crowns and bridges are often the best solutions for lost or damaged teeth. We offer a full line of high quality, custom-crafted crowns and bridges that will last for many many years and hopefully a lifetime. Dental implants offer a permanent alternative to dentures that look and work like your original teeth did - allowing you to eat like a kid again. Bonding and porcelain veneers correct crooked, chipped, discolored, or broken teeth with natural-looking, long-lasting materials. Root canals can save a tooth that otherwise would have to be extracted. You'll be amazed how our gentle methods can leave patients saying, "I didn't feel a thing." Teeth whitening, a system that helps restore your stained or discolored natural teeth to their original whiteness (and is up to 300% more effective that store-bought whiteners). Mercury-free tooth-colored fillings that will make all your teeth look as good as new.